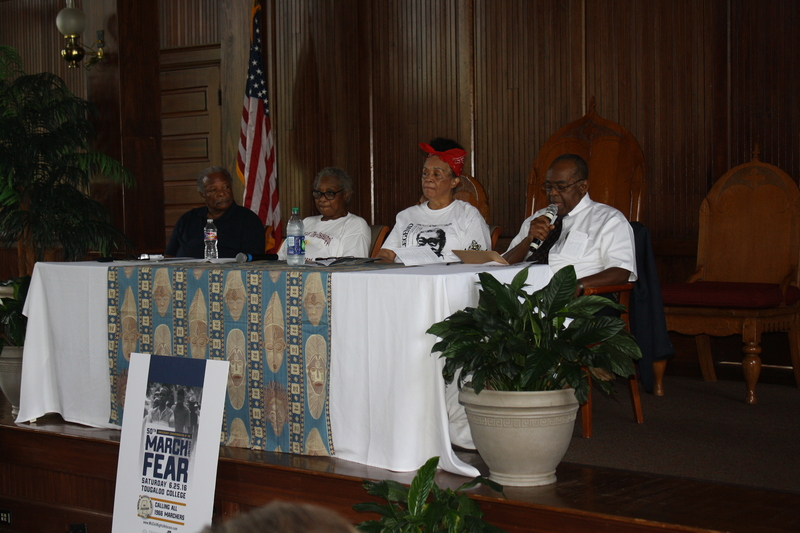 Area events commemorating the 1966 March Against Fear last week served as tools of inspiration and education for the hundreds who attended. The activities celebrated James Meredith, the first African American to enroll at the University of Mississippi in 1962, for starting his solo Walk Against Fear from Memphis, Tenn., to Jackson June 5, 1966 to protest white supremacy and to get blacks registered to vote. He was shot the second day of his walk and from there, national and local civil rights activists joined together to continue his efforts with the March Against Fear. The celebrations kicked off in Canton June 23, when a Mississippi Freedom Trail marker was unveiled for the Madison County Movement. The marker notes the work of CORE activists David Dennis, Matheo Suarez and George Raymond, who opened an office in 1963 to register black voters. Other activists such as Annie Devine, C.O. Chinn Sr. and Anne Moody later joined their efforts staging a boycott and creating Freedom Schools. On June 25, a program at Tougaloo College’s Woodworth Chapel, brought together several individuals who took part in the 1966 march. Pamela Junior, manager of the Smith Robertson Museum and Cultural Center, moderated the program. “Thank you for coming home for this celebration, and you honor Tougaloo College every time you stand on this historic ground,” said Tougaloo College President Beverly Hogan. Charles McLaurin, Annie Pearl Avery, Dorie Ladner and Dr. Robert Smith were the panelists. Each panelist shared how they became involved in the march or in the Civil Rights Movement. Avery of Birmingham, Ala., was the only panelist who didn’t actually participate in the March Against Fear. She did, however, participate in several marches throughout the South during the Movement. In one of her first attempts to get involved in sit-ins and join Freedom Riders, she purchased a bus ticket and packed a knife to defend herself in case things got violent. “The real opportunity for me (to get involved in activism) was when Mr. Meredith started this march,” said Smith, who also shared going into the Delta and hearing stories of struggle from sharecroppers who lacked medical care. “We were foot soldiers of the movement so to speak,” said Ladner, who explained how they were tasked with organizing people and events. She also worked with Fannie Lou Hamer, who had been kicked off the plantation she worked on in Sunflower County because of attempting to register to vote. Ladner also described being stopped by police at night unaware that sundown laws forbade blacks from being out after midnight. McLaurin reminisced about attending Smith Robertson School when he was boy and becoming a SNCC organizer during the movement. He also worked with civil rights icons Medgar Evers, Stokely Carmichael Bob Moses. McLaurin shared the details of Carmichael’s arrest in Greenwood as organizers were planning to lead marchers through the area. Carmichael had received permission from black leaders to allow the marchers to assemble and set up tents on the campus of Stone Street Elementary school – a school for blacks. However, the white leaders in town would not permit the tents to be erected. With nowhere for the marchers to rest, eventually the SNCC organizers chose Broad Street Park as a alternative site. Then the organizers went to get Carmichael out of jail. McLaurin said the park was overflowing with marchers. In his mind the only way the police would be able to remove the marchers would be to kill all of them, but instead the police just encircled the park. During a Q & A session later in the program, panelists responded to questions from the audience. 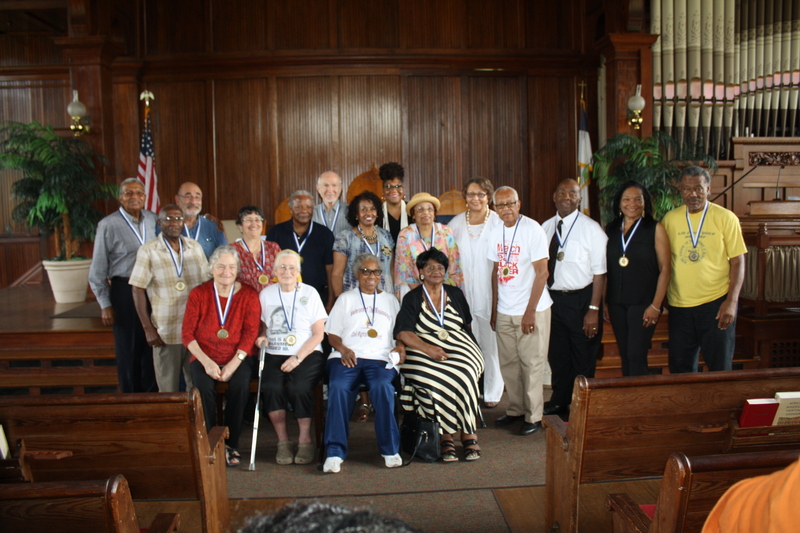 All of the panelists and other 1966 marchers in attendance received medals from Tougaloo College for their bravery. Others marchers included Flonzie Brown Wright, Joan Mulholland, Rev. Wendell Paris and Hollis Watkins. 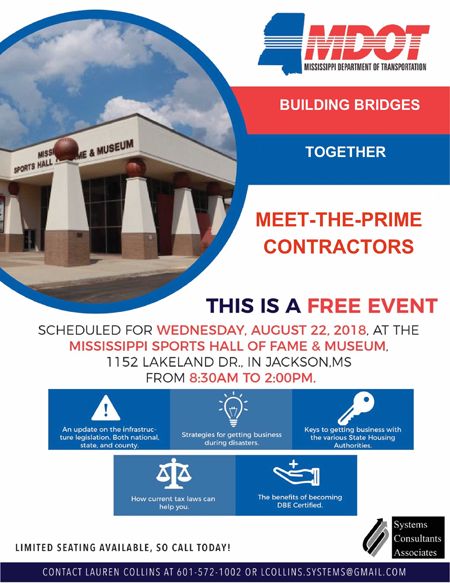 On June 26, activities began at the Smith Robertson Museum where attendees heard from Meredith and walked through the “James Meredith: Am I Or Am I Not a Citizen” exhibition. Meredith also sold some of his writings while at the museum. Afterward, about 200 or so people marched in the Walk For Good and Right from the museum to the state Capitol as African drums were played. On the Capitol steps, Watkins led the crowd in Freedom Songs. Speakers included Wright, Sen. Hillman T. Frazier, who presented Meredith with a resolution; Michael Harris of the James Meredith Institute for Citizenship and Responsible Action, and James Meredith. Several organizations sponsored the March Against Fear. Nissan was the corporate sponsor. 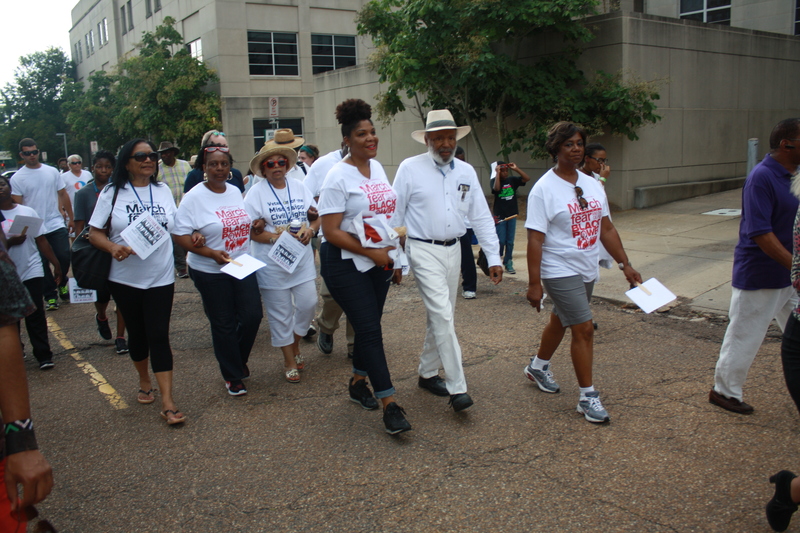 “Nissan is proud to have commemorated the 50th Anniversary of James Meredith’s “March Against Fear” with Tougaloo College, the Veterans of the Mississippi Civil Rights Movement and Smith Robertson Museum. 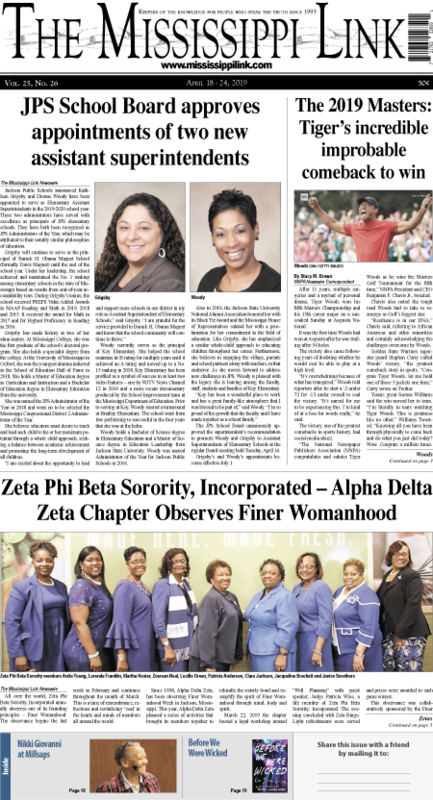 We are honored to have supported the dialogue, the recognition of the marchers and the overall historical spirit of the events,” said Pam Confer, director of Community and Public Relations for Nissan Canton. Shanderia K. Posey can be reached at sposey@mississippilink.com.